If you have full or partial dentures, you likely have experienced a time when they slipped out of place. Perhaps it happened while you were eating. Maybe you were talking to someone. It can make you a little self-conscious and tentative about your smile. Well, you have an option available that provides more security for your dentures—dental implants. Dental implants in Juno Beach can ensure that your dentures stay in place while the dentures provide the aesthetics and function above your gums. It’s a win-win! 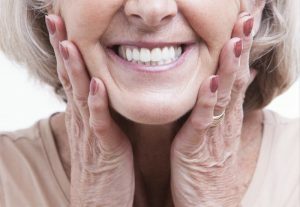 Learn more about the benefits of implant-retained dentures with this helpful information. With your partial or full dentures, you’re already aware that missing teeth can affect your appearance and your ability to eat and speak. But missing multiple teeth can dramatically affect your oral health. Your remaining healthy teeth can shift to compensate for the gaps in your smile. As a result, they may need to be extracted in the future as well. Dentures help the remaining teeth stay in position by filling in the gaps left on the surface. Also, when teeth are removed, the jaw bone can begin to lose density. Over time, it can affect your facial structure or your remaining teeth. Dental implants are surgically placed into the jaw bone, which stimulates it and causes it to grow around the post. This growth keeps the jaw bone healthy and strong and helps support any remaining natural teeth as well. Out of all the replacement options, dental implants fully restore the structure of missing teeth under the gums. Because dental implants fuse to the jaw bone, they are extremely stable and serve as an excellent foundation for prosthetic teeth. By using implant-retained partial or full dentures, you ensure that your dentures never come out of place again. Also, the stability of dental implants helps your dentures feel more comfortable and natural than dentures alone. As a result, you can bite, chew, speak, and smile with complete confidence. If cared for properly, dental implants can last for thirty years or even longer! In contrast, dentures, without the support of dental implants, need to be replaced about every five to seven years. If your dentures are in excellent condition, then you may be able to keep the same dentures to use with dental implants and extend their lifespan. By combining your dentures with dental implants, you can fully restore your smile’s function, strength, and health while giving your confidence a boost. You can enjoy the best of what both restoration options have to offer with implant-retained dentures. If you’re interested in discussing adding implants to your dentures, contact a qualified implant dentist in Juno Beach today! At Juno Beach Smiles, Dr. Greg Riley and Dr. Duane Keuning have been helping patients in the area for decades. Handling both the implant placement and restorations in-house, they and their staff are experienced and have completed countless hours of continuing education with prestigious entities, such as the Dawson Institute and Spear Institute. To contact them for an appointment, you can call (561) 622-7243 or click here.